Find hotel near Casa Memoriala Tudor Argh .. The poet Tudor Arghezi is one of the foremost figures in Romanian literature. He lived in this house for most of his life. His wife came from a rural background - as such, his home decor is totally Romanian traditional countryside. By the poet's own will the house was transformed into a museum after his death. Filled now with artefacts from his life, the museum also has a formidable library of several thousands of volumes. There are paintings of the poet, the awards he's received - his entire life, especially the professional period is quite well fleshed out. The building itself is a nice example of 20th century architecture. It has a beautiful garden. Hidden gem. 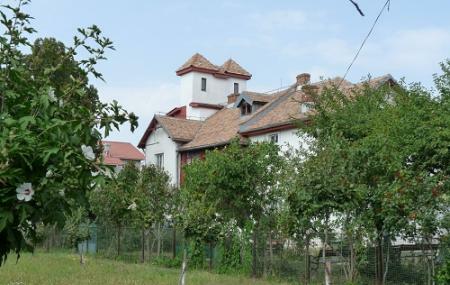 The house in which Tudor Arghezi, renowned Romanian writer, lived and created in the last part of his wife. The whole complex is made to mimic a country estate with bee houses, orchards, lots of flowers and grass with a twist, it's located in the middleof town, between high buildings and heavy traffic. It is one of a few forgotten corners of peace, quiet, nature and some history that can be found in town. Great place to visit in the spring. A green oasis minutes away from Bucharest downtown, probably the largest orchards across the city, surrounding an old villa that still belongs to well-known poet Tudor Arghezi's family. It definitely worth a visit - it is unique and surprising spot within the city!